I have a Spiderman themed library, "Get Caught in a Best Fit Book". You can easily adapt this Word document to fit the theme of your classroom! 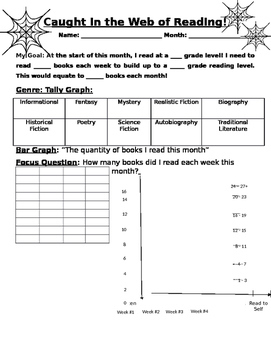 This document allows students the opportunity to track their genres, quantities, and mode of books read each week and month of the school year! Overall, we find that this resource is cross curricular, data driven, and highly reflective for students, teachers, and families.